Heat the oil in a large pan. Dust lamb pieces in the flour and brown in the hot oil. Set the lamb aside and brown the onions and garlic in the same pot until they are nice and soft. Place the lamb back into the pot and add the stock and juice from the lemons. Season with salt and pepper. Reduce the heat and stew the meat with the lid on for about an hour or until nice and tender. You can add more hot water or stock at this point if the liquid gets low while stewing. Gently place the waterblommetjies on top of the lamb and cover the pot with the lid. Let them “steam” on top of the lamb for about half an hour. They should still be quite firm but cooked. 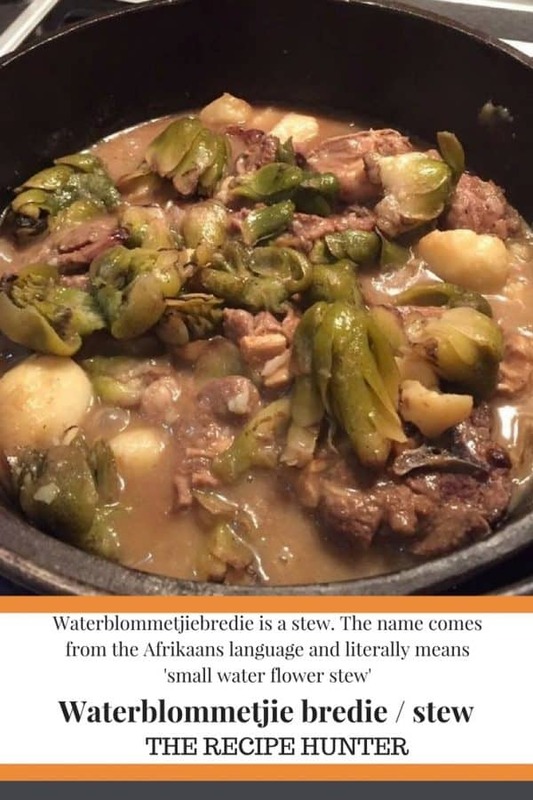 Don’t overcook the waterblommetjies as they will turn into mush. Serve on rice with extra lemon wedges on the side. The method as per the above. As you can see its perfect!! This looks amazing!! I’m inspired. Corlea, its worth a try, but here in Canada, you will have to buy the tinned waterblommetjies from a SA shop. I have used it and it’s good.